What Makes a Good Running Shoe? I get asked all the time, “What is a good brand of shoe for running?” or “What type of shoe should I get for running?” With so many different types of shoes on the market and all the advertising that goes with them, figuring out which shoe is best for you can be a challenge. I am going to go over a few things to look for when buying a pair of running shoes and hopefully dismiss some common misconceptions. First of all, it’s important to realize that what works great for one person, may not be so great for someone else. 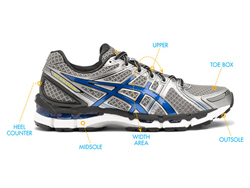 That being said, there are 3 basic essentials to look for in a good running shoe. First is the heel counter – this is the back of the shoe that wraps around and cradles your heel. This should be thick and firm, and not collapse when you squeeze it between your fingers. Your heel is the first part of your foot that strikes the ground when running. A stable heel counter will protect your foot from rolling out from under you and reduce over-pronation. If you’re having ankle pain with running, a soft heel counter may be the problem. Second is the midsole – this is the part of the shoe between the upper material that houses your foot, and the bottom outer sole that hits the ground. This is really the most important part of the shoe in terms of cushioning and stability. Different brands use different components here that will that will change the flexibility and support of the shoe. 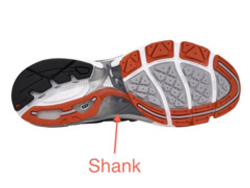 The key here is to find a shoe with a very stable midsole in the arch of the foot which is referred to as the shank. You can easily tell this by trying to bend the shoe into a “U” shape. If you can bend the shoe like this, the shank is way to flexible, and will result in instability which can cause running injuries and chronic problems over time such as plantar fasciitis. The third is the last shape – this refers to the actual curvature of the shoe. There are three types: straight last, semi-curved last, and curved last. The last shape will affect the weight and support the shoe offers. The most supportive shoes are straight last, and as a side effect are also heavier, and often “clunky.” The lightest running shoes use a curved last, which sacrifices support for decreased weight. The most common last is the semi-curved, which are more stable than curved, but less bulky than straight. 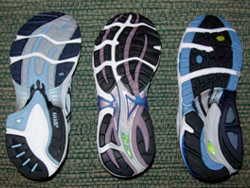 Straight last running shoes are the least common and used when maximum motion control is needed. Hopefully this information will help you better understand what to look for what choosing your next pair of running shoes. If you have more questions, feel free to leave a comment and i will get back to you as soon as possible. You can also call to make an appointment if you would like to see our line of running shoes or would like to see how we can make you a better runner. Are you happy with the care you received from Greenville Foot and Ankle? Please leave us a review by clicking the links below!